I recently went to Blaze Pizza at the Dundas/Yonge location and it was the first day of opening so they were giving out free pizzas. I had to line up and wait an hour before I was even inside the place. Once inside I saw a ton of workers behind the counter, there must have been at least 6 people just for putting on the ingredients, each section had a person, like the crust section had a person, the cheese section another, then there were 2 people for the vegetables and meats. There was one person dedicated to just cooking the pizza and another for just packaging it. This doesn't seem like a sustainable business model to me as subway's always have 1-2 people doing all the work, at least behind the counter. But, it must have been because they were anticipating a large number of customers for the free pizza otherwise having that many workers there all the time doesn't make sense. The workers seemed really nice and happy to be working there, but it was their first day on the job so they haven't had any real experience. Starting my order was as easy as subway's, I first had to choose the type of crust I wanted, either regular or gluten-free, and then the cheese or cheeses, afterwards it was the vegetables and meats. I wanted extra chicken on mine so I told the worker behind the counter to add more and she asked if I still wanted more to which I said yes, it didn't seem like there was a limit to the amount of chicken I could add to the pizza. Eventually, the pizza was covered with chicken pieces so I told her that's enough and besides I felt bad taking so much chicken. After that, my pizza was basically done and I had to wait for the cook to put it in the oven. The oven actually looks really nice. Its shape looks like a regular pizza oven's, but is made from stainless steel. There are visible flames coming out from each side of the oven. Waiting time was around 5-10 minutes after my pizza was constructed. I think the cooking time was around 2-5 minutes, but it was relatively quick. However, the crust on my pizza ended up burned which I was not happy with. even fried chicken was less greasy than blaze pizza's pizza. To add insult to injury, the crust was so thin that the toppings all fell apart when I picked up a slice, as if though the crust was a piece of paper. Looking at it from the side the crust was razor thin! 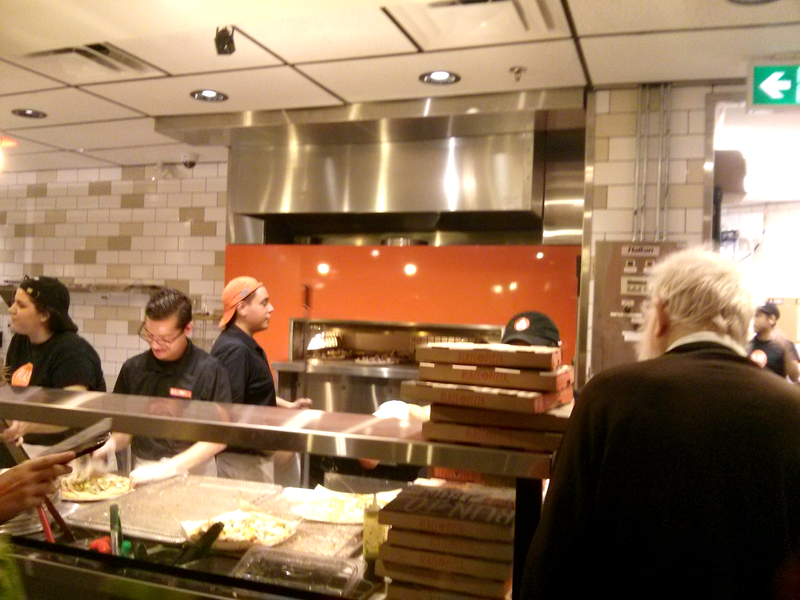 Given Blaze Pizza's entire business model, this isn't surprising at all. Blaze Pizza wants to create a subway-like experience, but with pizzas. There is probably no way they could prepare a complete pizza out of scratch in less than 10 minutes without making the dough as thin as possible. This is because the dough is what takes a long-time to cook when making pizza. Their meats were precooked and were only warmed up in the oven. The cheese takes little time to melt at the extremely high temperature they're using. The only thing that takes time is the dough. Because of this, the dough will always be razor-thin unless they start offering customers the option to wait longer for a thicker pizza. After I was done eating I was still hungry. It definitely did not fill me up. Usually when I get pizza from say Pizza Pizza and I get their large, which is about $13, I eat about 3 slices at a time and stay full for about 4-5 hours before I eat another 2 slices. I always have leftover slices for the next day which justifies spending $13 on a pizza. 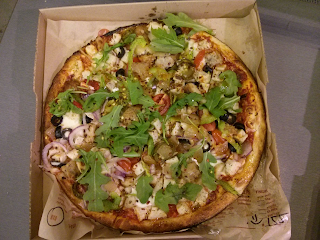 Blaze Pizza costs $11 and it only comes in one size, small. All in all, the pizza felt like a rip-off even though I got it for free. The razor-thin crust and the bland taste of the pizza makes me wonder how Blaze Pizza has stayed in business for so long. It has nothing unique going for it other than its short waiting-time. 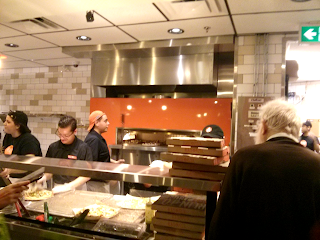 Other pizza joints like Pizza Pizza also offer a ton of customization so what Blaze Pizza is doing is nothing new.